Championing human rights in the face of violent racism, Patrisse is a survivor. She transformed her personal pain into political power, giving voice to a people suffering in equality and a movement fueled by her strength and love to tell the country—and the world—that Black Lives Matter. Powerful, disturbing and unfortunately will not be read by many of the people who really need to hear this stuff. The stories in this book are moving and heartbreaking. 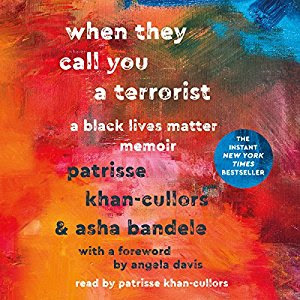 Patrisse shows you the inequities in our judicial system through her personal stories, how young men of color are vilified and still found to be less than in our society which supposedly ended slavery and gave people of color equal rights. The prison sentences are longer, the charges more extreme the reaction of cops and white citizens more fearful even to this day. Black lives matter isn't about other lives being less than its about black lives mattering just as much. Our society is so fearful and finally the inequities are being brought out of the dark thanks to social media and the black lives matters movement. I don't expect things to change overnight, and I honestly think they may have gotten a bit worse as more of these inequities are brought to light. I'm not sure why the fear of true equality for all is there but the more these issues have a light shown on them the more likely there will be change as more people start to really see and understand the problems. This book makes understanding the inequities and reality of many poor black families accessible in an easy to read, hard to put down book. It shines a light on white privilege just by showing what it means to be black in America. It is up to us all to stand up for injustice for only then will things change. It also shines a light on what it is to be Queer in America, how we define ourselves and others and how we build our tribe, not just the families we are born into but those that we build around us. Well written prose that is often like a poem and extremely honest this book might be hard to read because of the content but is an honest hard look at the problems in the "land of the free".